Corrected on 25 March 2019. The corrections are indicated in red. The current account was in deficit in the fourth quarter of 2018. The value of goods exports in balance of payments terms increased by five per cent and the value of service exports by five per cent. 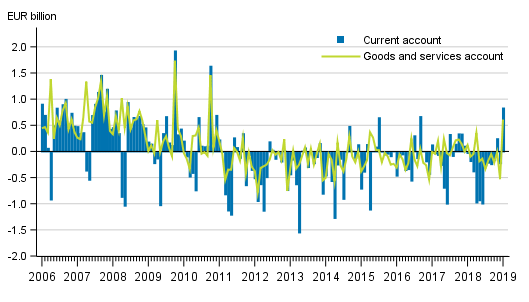 The net exports of goods and services remained in deficit as imports grew more strongly than exports. The deficit of the current account was curbed by positivity of the primary income account. The net international investment position remained negative . The data appear from Statistics Finland's statistics on balance of payments and international investment position. In the fourth quarter of 2018, the current account was EUR 0.1 billion in deficit. The balance of goods and services showed a deficit of EUR 0.8 billion. Of the sub-items of the current account, the primary income account was EUR 1.2 billion in surplus and the secondary income account EUR 0.6 billion in deficit. The trade account in balance of payments terms was EUR 0.1 billion in deficit in the fourth quarter of 2018. In the corresponding quarter of the previous year, the trade account surplus amounted to EUR 0.3 billion. The service account showed a deficit of EUR 0.7 billion in the fourth quarter of 2018. The service account weakened particularly due to the strengthening exports of telecommunications, computer and information services and other business services compared to the corresponding quarter of the previous year. On the other hand, exports of other business services were exceptionally high in the fourth quarter of 2017. Goods exports in balance of payments terms amounted EUR 16.2 billion in the fourth quarter of 2018, which means that goods exports strengthened by five per cent from the corresponding period of 2017. 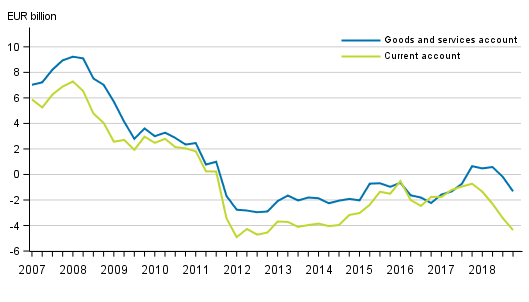 Goods imports rose to EUR 16.3 billion, rising by eight per cent year-on-year. In the fourth quarter of 2018, service exports grew by five per cent and service imports by 15 per cent compared to the corresponding quarter of the previous year. Service exports rose to EUR 7.9 billion and service imports to EUR 8.6 billion and thus the service account again showed a deficit. The primary income account was EUR 1.2 billion in surplus in the fourth quarter of 2018. The primary income account includes compensation of employees, investment income and other primary income paid abroad from Finland and from abroad to Finland. The surplus of primary income was mainly due to investment income, which includes such as returns on capital like interests and dividends. EUR 1.0 billion were paid in investment income in net to Finland in the fourth quarter of 2018. The secondary income account was EUR 0.6 billion in deficit in the fourth quarter of 2018. The current account was EUR 0.8 billion in surplus in January. The value of goods exports in balance of payments terms grew by 11 per cent from twelve months back. Of the sub-items of the current account, the trade account and the primary income account were in surplus. The trade account in balance of payments terms and the secondary income account were in deficit. At the end of the fourth quarter of 2018, Finland had EUR 741,5 billion in foreign assets on gross and EUR 745.7 billion in foreign liabilities on gross. The net international investment position, that is, the difference between the stock of assets and liabilities, was thus EUR 4,2 billion negative as there were more liabilities than assets. The net investment position strengthened compared to the end of the previous quarter, when the net international investment position was EUR -9.0 billion. Finland's foreign assets and liabilities have grown during the quarter considerably as a result of a significant enterprise reorganisation. Examined by sector, several sectors, such as investment funds and employment pension schemes, had a weakening effect on the net investment position in the fourth quarter of 2018. Other monetary financial institutions and non-financial corporations mostly showed an opposite development. 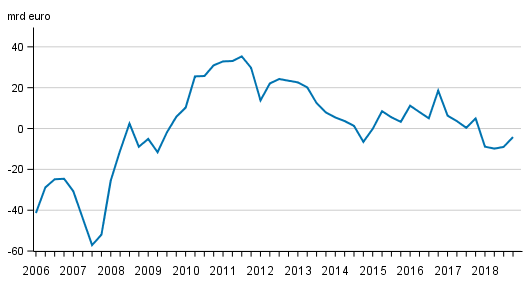 Of financial claims, growth was significant in Finland's foreign assets in deposits and derivatives and in liabilities, such as bonds and derivatives. At the end of the fourth quarter, foreign direct investment assets on gross stood at EUR 151,4 billion and the corresponding liabilities at EUR 117.0 billion, as a result of which the investment position of direct investments was EUR 34,4 billion positive at the end of the fourth quarter. The net investment position of the non-financial corporations improved in the fourth quarter of 2018 compared to the previous quarter, being EUR -84.7 billion at the end of the fourth quarter. Both assets and liabilities of the non-financial corporations were falling, but liabilities fell considerably more. Portfolio investments, whose liabilities stock fell during the quarter by EUR 11.8 billion to EUR 94.1 billion, had most effect on improving the net investment position. The biggest foreign assets of non-financial corporations were in direct investments. The non-financial corporations sector had EUR 117.7 billion in such assets and EUR 100.8 billion in liabilities. The net investment position of direct investments was EUR 16.9 billion positive for the non-financial corporations sector. Between the third and fourth quarters of 2018, a clear change took place in the net investment position of other monetary financial institutions as a result of a significant enterprise reorganisation, when EUR -147.6 billion turned into EUR -107,0 billion. Other monetary financial institutions include deposit banks and other credit institutions. The changes were visible primarily in portfolio investments and other investments, which include loans from outside the group, deposits and trade credits. The foreign assets of other monetary financial institutions grew from EUR 82.4 billion to EUR 227,4 billion. The assets were biggest in deposits and derivatives. Derivatives were also among the biggest risers for liabilities in addition to bonds. The net international investment position of the investment funds sector fell by EUR 5.5 billion, being EUR 50.8 billion positive at the end of the quarter. The biggest foreign assets and liabilities of investment funds are in portfolio investments and the biggest part of the fall in the net international financial position is explained by the negative value change of quoted shares. In general government, social security funds have the biggest net foreign assets, EUR 139.9 billion. Most of them consisted of portfolio investments, whose negative value changes had a significant effect on the fall of net assets. Net foreign assets were EUR 3.8 billion lower than in the previous quarter. In contrast, the net financial position of central government was negative and was EUR -78.3 billion at the end of the fourth quarter. Central government's largest liabilities mainly comprise bonds that are classified in portfolio investments. Their amount remained almost unchanged in the quarter. The households sector and non-profit institutions serving households had EUR 11.3 billion in foreign assets at the end of the fourth quarter, most of which were various portfolio investments. These sectors’ net financial position fell during the quarter by EUR 4.4 billion mainly due to the effects of a significant enterprise reorganisation on foreign assets and the general negative value change in portfolio investments during the quarter. Households and non-profit institutions serving households also decreased their holdings in foreign quoted shares. In January, net capital inflow to Finland amounted to EUR 3,3 billion. Of the sub-items of the financial account, net capital inflow was mostly in the form of portfolio investments. Net capital outflow from Finland was most in the form of other investments. ISSN=2342-348X. January 2019. Helsinki: Statistics Finland [referred: 20.4.2019].